Fill in this form to get our brochure and find out more! The Academic Credentialing Program (ACP) is modeled after historically successful programs in the accounting, legal, and medical professions wherein specific educational curricula are mastered and the student is then able to add specific professional recognition to the academic recognition received from the educational institution. The Academic Credentialing Program (ACP) is modeled after historically successful programs in the accounting, legal, and medical professions wherein specific educational curricula are mastered and the student is then able to add specific professional recognition to the academic recognition received from the educational institution. The recognition is attained by successfully passing an examination created and administered by the specific profession. The examination created and administered by PAHCOM, for the healthcare administration profession, is the Certified Medical Manager (CMM) credential. The CMM Exam validates knowledge of the Nine Domains of Medical Practice Administration. Participants who pass the CMM Exam are awarded the temporary credential of Certified Medical Manager – Academic (CMM-A). The credential is converted to the full CMM credential upon attainment of two years of healthcare environment experience. Key program resources: Tools for student success! The examination created and administered by PAHCOM, for the healthcare administration profession, is the Certified Medical Manager (CMM) credential. The CMM Exam validates knowledge of the Nine Domains of Medical Practice Administration. PAHCOM is a national organization dedicated to promoting professionalism in physician office practice by providing professional development opportunities, continuing education in health care office management principles and practice, and certification for health care office managers. 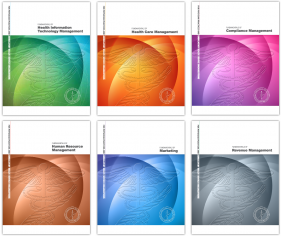 PAHCOM Manuals contain current information relevant to Healthcare Management. These resources are useful for exam preparation, continuing education, and as textbooks in related programs. Discounts apply to member rates with the exception of Manuals. Two (2) years of healthcare industry experience accrued within four (4) years of passing the CMM Exam. Must be in support of patient care, as in a medical practice or other clinical environment. Research a topic discussed on the PAHCOM ListServ Forum. Write a two (2) page summary to include benefits of collaboration. Participate in a webinar listed on the PAHCOM Education Calendar. Write a two (2) page summary about the webinar. Research a topic featured in The PAHCOM Journal. Write a two (2) page summary to include impact upon healthcare management professionals. PAHCOM Manuals contain current information relevant to Healthcare Management. Approved programs qualify for special ACP Rates. Give students the professional advantage! Medical, Healthcare, and Business Management Programs are encouraged to apply. A minimum of 7 of the 9 Domains of Medical Practice Administration must be represented by applying program curriculum. "Karen Blanchette, director of the Professional Association of Health Care Office Management, suggests looking for a program affiliated with a national association. PAHCOM’s Academic Credentialing Program, for instance, offers students the ability to prepare and sit for credentialing exams to become Certified Medical Managers." Approved academic programs provide great benefits to participants. Share information about the Academic Credentialing Program with Leaders of Healthcare and Business Management Programs to become an Academic Ambassador!